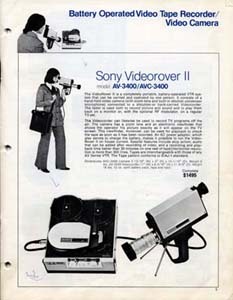 Sony EIAJ 1, ﾽ" open reel portable recording and playback system. 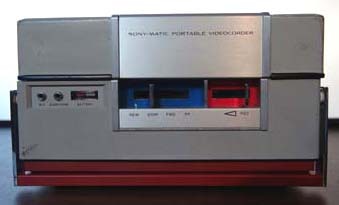 The SONY AV-3400 is a portable record/playback Videocorder designed to operate with the SONY AVC-3400 Video Camera. 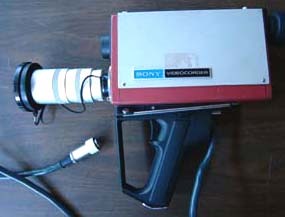 The system will record "live" action, and the recorded picture can be immediately played back and viewed on the camera viewfinder screen. It will greatly aid in teaching, training, promotional activities and in hundreds of other applications. Please read this manual carefully and keep this booklet handy for future reference. Record/Playback Functions with Complete Portability The AV-3400 provides high quality video and audio record/playback functions in a truly portable compact unit. 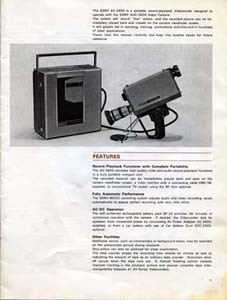 The recorded material can be immediately played back and seen on the camera viewfinder screen, a video monitor with a connecting cable VMC-1M, supplied, or conventional TV screen using the RF Unit optional. The SONY-MATIC recording system adjusts audio and video recording levels automatically to assure perfect recording with very little effort. The self-contained rechargeable battery pack BP-20 provides 45 minutes of continuous operation with the camera. If desired, the Videocorder may be operated from household power by connecting Ac Power Adaptor AC-3400, supplied, or from a car battery with use of Car Battery Cord DCC-2400, optional. Additional sound, such as commentary or background music, may be recorded on the prerecorded picture during playback. Stop-action can also be obtained for close examination. The time counter shows the recording time minute by minute as well as indicating the amount of tape as an ordinary tape counter. Automatic shut-off occurs when the tape runs out. A manual tracking control corrects improper tracking in the playback picture and assures complete tape inter-changeability between all AV-Series Videocorders.